Andrew Knight is the founder of the Extreme Vegan Sporting Association a group established to showcase vegan fitness. He is also a European veterinary specialist in welfare science, ethics and law, a Fellow of the Oxford Centre for Animal Ethics, which is dedicated to advancing the ethical status of animals through academic research, teaching, and publication, and the Director of Animal Consultants International, which provides multidisciplinary expertise for animal issues. Andrew has authored over 50 scientific and 30 popular publications on animal issues, including an extensive series examining the contributions to human healthcare of animal experiments. These formed the basis for his 2010 PhD, and his 2011 book The Costs and Benefits of Animal Experiments. When I was 23 my girlfriend and I both went vegan at the same time in an attempt to impress each other. It must have worked because we’re still good friends many years later. Too long (because I’m ancient), but not long enough (because I wasn’t smart enough to start from birth). Hard to say as the list is so long. I have the satisfaction of knowing my life inflicts the least harm reasonably possible on other sentient creatures, the least adverse environmental impacts, and the least inequitable consumption of limited global food, water and land resources. I hardly have any body fat and am much fitter. My animal advocacy career has taken me around the world and I’ve met some wonderful, inspiring people. And like I said, it impressed my girlfriend, which was very important at the time. I don't consume or use animal products or those tested on animals to the extent reasonably possible. Of course virtually everything in the world is linked to everything else in some way, and it’s impossible to walk the Earth without participating in abuse of others to some degree (every footstep squashes microbes, for example). But I try to do the best I can. Perfection is unrealistic. I very rarely iron, but I cross train regularly by running. However, when training for my last mountaineering challenge, I was knocked from my bike after riding home from weightlifting at the gym, and have just had surgery to fix my fractured elbow. This was sufficient proof that weights are bad for my health, so I’m staying away from them. At least until my arm recovers. I’m not too keen on bikes either. When fit and not working I run nearly every day, or I start to get frustrated. If anyone wants to try anything extreme and possibly foolish then I’m more than happy to advise them. Other than one brilliant English lad who went sky diving in a banana costume to publicise the vegan diet, unfortunately no-one has asked – or taken – my advice. Ironing. The more extreme kind. Combining “the thrill of a danger sport with the satisfaction of a well-pressed shirt” the popularity of extreme ironing has risen spectacularly. International championships now exist, with the English recently beating the Australians by having the greatest number of people ironing underwater at the same time, in a flooded quarry. The waters were so freezing they desperately hoped they’d never have to win back the title. As a native Australian though, I rather hope otherwise. Maybe I can make the Aussie team someday with sufficient training. But Aussies are tough, so I realise this will have to be hard-core. This was why in late 2011 I carried my mountaineering ironing board to the summit of Wales’ highest mountain, Mt Snowdon (1,085 m). I was almost blown off the top by 50 mph winds, but for a few seconds on the summit I was the highest ironer in all of England and Wales. The photos of this amazing adventure are here. One year later I’ve just returned from an ironing trip to the French alps. I ironed above 3,000 m in temperatures as low as -20 C. A wilderness snowstorm even enabled me to practice survival ironing. My shirts got seriously crisp that day. 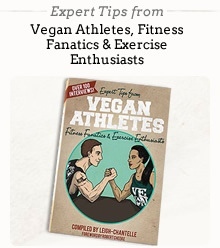 Personally, I’ve tried to address this by establishing the Extreme Vegan Sporting Association, which exists to showcase vegan fitness, and to demonstrate just how much fun the vegan lifestyle can actually be! Probably a certain stupidity. I ski black slopes in the Alps my friends don’t like. I think I’m just less aware of the potential consequences, or a lot more foolish. Whatever it is, it seems to work! Figuring out how to transport sufficient vegan cheesecake for my very substantial needs to the tops of the mountains I sometimes climb. I don’t discuss my expeditions a great deal with my co-workers. For some reason they seem to think I’m mad. My family are mostly not vegan, and oddly seem to prefer not to discuss food with me too much! And my friends are mostly vegan anyway. Q: Where do you get your protein? A: Virtually all plants have protein, just to differing degrees. If you want a lot of it, you just have to pick the right foods. It’s not hard - massively strong animals like elephants and gorillas manage just fine. I just want to try to be the best person I could be, which means doing the most good, and the least harm, that I reasonably can, to sentient others. And I’d also like to make the Australian extreme ironing team, and beat the British. A lot. Dinner - Rice/pasta/cous-cous or other carbohydrate-rich base + stir-fry veggies with one of the fake meat products (burgers, sausages, tofu, nut roast, etc) + vegan cheesecake or yoghurt. Vegan multivitamin (including B12) and flax oil (for the omega 3 fatty acids) pills/capsules daily. Gaining muscle - Lift weights very regularly, and eat plenty of healthy, vegan food. Don’t burn too many calories, e.g. by jogging too much. Get plenty of rest. Losing weight - Jog very regularly, eat moderate amounts of healthy vegan food. Don’t be lazy. Maintaining weight - Balance your intake of healthy vegan food and calories, with those you burn in exercise, in order to increase, decrease or maintain your weight as desired. Improving metabolism - To increase metabolic rate, exercise! Toning up - Again – very regularly exercise. Often, through example. By staying, and hopefully appearing fit and healthy, trying not to be (publicly, at least) unwell, and by having fun vegan adventures people enjoy hearing about! Of course I’m open to other extreme vegan sports too (the website includes numerous galleries including yodelling and cooking, as well as conventional sports like body building), but it’s hard to imagine anything more extreme than ironing! The Mt Snowdon climb nearly killed me.